I am a huge fan of Faith Martin and Hilary Greene. Yes I do realise that Hilary Greene is a fictional character but I think that she is fab and she is real to me. In fact I am a bit of a Hilary Greene groupie. Each time a new Hilary Greene book is released, I eagerly grab hold of a copy and read it just as soon as I can. The latest Hilary Greene book ‘Murder In Mind’ was released on 8th October 2018. I absolutely, totally and utterly loved reading it but more about that in a bit. Hilary Greene is the sort of woman boss I would love to work for. She is feisty, loyal, determined, strong, fair, supportive and at times she can be intimidating. Hilary has a great sense of humour, she mucks in to do her fair share of the workload and she wouldn’t ask you to do anything that she isn’t willing to do herself. At the same time she doesn’t hesitate to let you know if you have upset her or dropped a clanger. This book sees a different Hilary in a sense. She has to get to know another boss and to adapt to working with him. The beginning of the book sees her trying to suss him out and of course he tries to suss her out. Another cold case lands on her desk which demands the attention of Hilary and her team. There is one person on her team that Hilary doesn’t trust one little bit and she is intrigued as to what he could possibly be up to. Oh and if that wasn’t enough Hilary was the lucky recipient of a marriage proposal and she has to decide whether or not to accept it. Times are a-changing for our heroine. What will she do? Will Hilary and the team manage to solve the case? Well for answers to those questions and more you are just going to have to read the book for yourselves to find out as I am not going to tell you. Every time I pick up a book by Faith Martin, I know that I am going to be in for one hell of a read and so it proved for ‘Murder In Mind’. The author’s writing style is such that she grabs your attention from the first word on the first page and before you get to the bottom of the page, you are hooked. That’s what happened to me any way. I have read the whole of the Hilary Greene series and each time I read a new book it feels as though I am reuniting with old friends. I absolutely love anything to do with cold cases and so when I read the later Hilary books, I feel as though I am an invisible member of Hilary’s team. I find myself occasionally shouting out random comments and even suggestions on how the investigation should progress. Before anybody starts, I know that this book is fiction but I tend to ‘live’ the story if I am convinced by the writing and the characters. ‘Murder In Mind’ is really well written. The book isn’t particularly long but the chapters are quite long. That said, I didn’t really notice how long the chapters were because I was enjoying the story and the characters so much that I just kept turning those pages without looking at how much more I had to read of that chapter. It didn’t take long at all for me to get through the book and I was genuinely gutted when I got to the end of the last chapter. I was enjoying the book so much that I just wanted it to continue on and on. I usually have the attention span of a gnat but not in this case because my sole focus was on the book and I was able to shut out all other distractions. Reading ‘Murder In Mind’ was much like being on a slightly scary and unpredictable rollercoaster ride with a fair few twists and turns along the way. I must say that I absolutely love Faith Martin and her books. She currently has two series out. One – the Hilary Greene series printed by Joffe books and the other series features WPC Trudy Loveday printed by HQ Digital. If I was asked to pick a favourite series it would be the Hilary Greene series. Over the course of the series I feel like I have got to know her far better and I feel like she is a true friend. I also love the fact that Hilary Greene deals with cold cases as I absolutely love anything like the television programmes ‘Cold Case’ & ‘New Tricks’. It means that I can indulge my fantasy of being a police officer and have a stab at investigating crimes for myself. 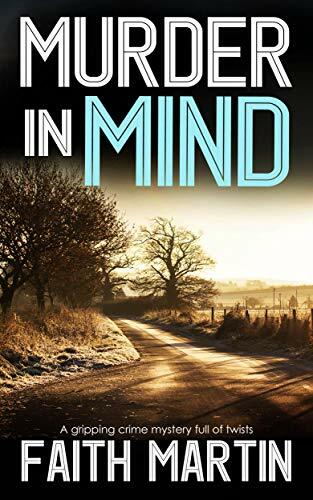 In short, I absolutely, totally and utterly adored reading ‘Murder In Mind’ and I would definitely recommend this author and this series to anybody and everybody. ‘Murder In Mind’ can be read as a standalone but for certain references to past events to make sense (& because I am a bit OCD) I think that it would be best to read the series from the beginning and in order. Believe me, you won’t regret it. There is still one more book in the Hilary Greene series to come and I don’t know what I will do when the series finishes. Here’s hoping that we have a long time to wait. I am attempting to delay the inevitable sad farewell. Actually I do know what I will do- I will just start reading the series from the beginning. Problem sorted. The score on the Ginger Book Geek board is a very well deserved 5* out of 5*.